Mount Lavinia Magistrate Mohomed Shahabdeen issued an order yesterday prohibiting the sale of a property down Templar's Road , Mt. Lavinia, that...... has been mortgaged to a bank and was put on sale by the bank to recover defaulted mortgage commitments. 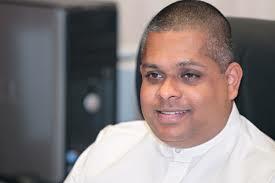 The property purportedly belonging to ex-MP SajinVaas Gunawardena, was mortgaged to the bank by a property development company after it was purchased for Rs 163 million. The sale of a property, 309 perches in extent at Soysa Mawatha , Templars Road , Mt. Lavinia purchased by Asian Cotton Mills too was similarly prohibited by another Court Order.This land was mortgaged by Asian Cotton Mills to a bank after it was purchased . But this property had been sold outright according to a complaint received by the FCID which has launched a probe into the transaction. Following a request by the FCID , the Land Registrar had issued an order forbidding the transfer of the land under reference.